Midsummercelebration June 21, long days with lots of light! It´s wonderful! Stay with halfboard, 2 nights in doubleroom from SEK 2490 per person including a nice breakfast, 1 two course dinner, a midsummerbuffé, and one afternoon tea. 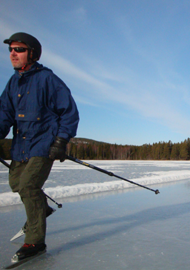 Iceskating & Ski-package during Feb. and March 2019. See in the column to the right. 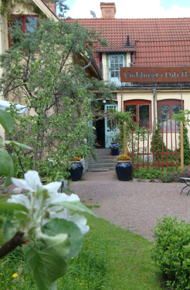 In the summer there are plenty of activities in Dala-Floda or just relax and read a good book in the shade of the appletree in the beautiful garden, take a cup of coffee at the café or just find Your own place at the Inn. Nearby there is a lake for swimming and a sauna. In the woods around there are paths and You can go for a nice hike to the “Fabod” at Flomountain or to “Kvarna” an old mill and buildings in wonderful nature. You can also visit a very nice organic farm were they sell vegetables and other organic food, a wool spinning factory among some of the sights worth seeing in the village. If You like more adventures “Kajaktiv” is the place, a shop and business very specialized on kayaks, renting, courses etc. See link at the left. 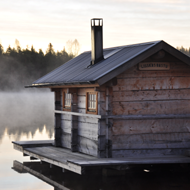 The sauna can be rented for SEK 450 during the summer which includes rent, wood and heating. Including rent and wood making the fire your self, SEK 250. Add an extra night with a two course dinner for SEK 950. “Komidsommarfest”, July 7 to July 14, is a very special week with lots of cultural activities, nature-experiences and good music for everybody. This festival has an old tradition. In the old days, during the first months of the summer including Midsummer, all the young women were at the Fabod taking care of the cows. 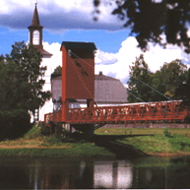 As they came back to the village a “Cow-Midsummer festival” were celebrated, about two weeks after Midsummer. We still celebrate this festival in Dala-Floda but nowhere else in Sweden. 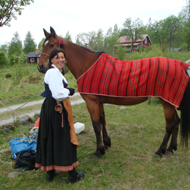 "Faebodtur" To hike or by horse or sitting on an old traditional van is a lovely activity in Dala-Floda. Go to wonderful places through villages and woods. Either by your self or with a local guide. "Kayaking" There are great rapids were "Kajaktiv", the local company, arranges courses and has a nice shop with equipments for kajaking. You can either paddle in white water in the river or "stand up"-paddling at Flolake were its calm and peaceful. "Floating-hike" along the old traditional way people used to carry the timber to the river, through the woods in smaller streams, canals etc. Go by yourself or with local guide. "A day at the organic farm" were the family or group start with a nice breakfast in the old converted barn. A tour arround the farm seeing the sheeps, hens, peacocks and greenhouses among other things with a guide from the farm. ICESKATING! During the winter there is a several km long ploughed track on the lake just by the Inn and ski-tracks in different places in the village. We have ice-skates to rent. If You like there is lake Runn 60 km from Dala-Floda with tracks ranging from 1 km to 50 km. Or You can take our "kicks" around the village or on the ice. If You like, just relax at the Inn.